The glazing systems and fasteners shown below are for use with multiwall polycarbonate panels. 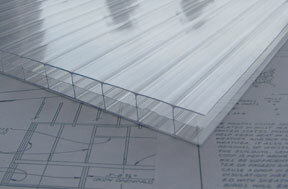 Polycarbonate extrusions are in a choice of colors and are made from the same material as the sheets. They are available in several shapes including "U" end caps and joining "H" shapes. Also available is a two-piece joining extrusion which consist of a base, which is fastened to the frame and a cap which snaps into place to hold the sheets (Cap & Base). These profiles are non-structural and depend on the frame of the structure for support. PLEASE READ BEFORE YOU ORDER: The items listed below can be purchased in small quantities. However, there is a small order fee of $35 on orders that total under $601. Also, there can be other freight charges that do not show on your online order. Small quantities of profiles cannot be shipped via UPS if they are over 8 ft long, otherwise they will ship via common carrier freight. If you have shipping questions please call us at 888-326-8634. 'click here' To Find Out How To Order Various Lengths. Note: Specifying your profiles to be cut in 8' or less increments will lower shipping cost. 'click here' for polycarbonate sheeting.